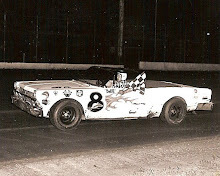 Knoxville, Iowa (June 7, 1969) – Indianapolis 500 veteran A.J. 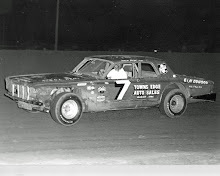 Foyt got the checkered flag first, but actually finished second to Keokuk, Iowa’s Don White in the 100-lap United States Auto Club new-model stick car race at the Marion County Fairgrounds on Saturday night. 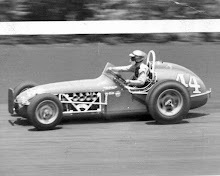 A crowd of 5,362 thought Foyt, who started last in the field of 19 after topping the time trials, had taken the lead when he passed White on lap 69. However, Foyt had made a brief pit stop on lap 51 and was actually a lap behind according to officials. “When they give you the white flag and then the checkered flag, what else can you think, except that you won,” said a disgruntled Foyt after the race. White’s time in his 1969 Dodge Charger as 43 minutes and 19 seconds. 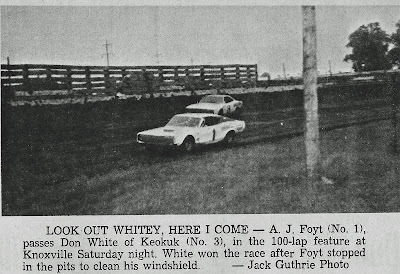 Foyt drove a 1969 Ford Torino. 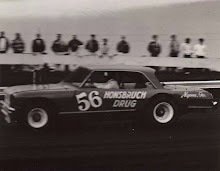 Larry “Butch” Hartman of South Zanesville, Ohio, took the lead on lap 6 and held it until Foyt took over on the 33rd lap. 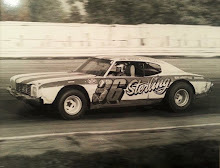 Hartman was sidelined five laps later when he hit a fender on the track and tore up his car’s undercarriage. Foyt held the lead until lap 43 when he brushed the wall coming out of the first turn and was passed by White, who led the rest of the way. The program was about 90 minutes late in starting and the feature was run immediately after the time trials because of threatening weather. Weather almost caused Foyt, Roger McCluskey and several USAC officials to miss the race. Foyt, who was to pilot his own plane from Milwaukee, where he was to compete in the Rex Mays 150 the next day, decided against flying and the group chartered a plane instead. Verlin Eaker of Cedar Rapids, Iowa, captured third and McCluskey, the point’s leader, finished fourth.